Register Log In Home Forums Mechanical/Maintenance Forum Benz I-5 diesel wake-up? 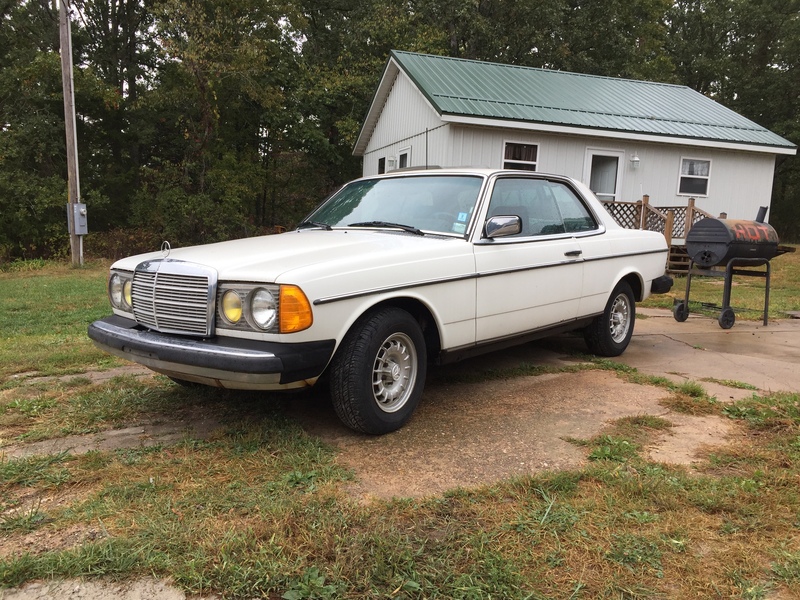 Just acquired a 1982 Mercedes 300CD with the OM617 turbo diesel. The PO, a friend, lives over 400 mi. away from me so I'm storing it at a friend's shop nearby for a few weeks until I can come back and hopefully drive it home. It was driven as recently as a year ago, and started only a few months ago. It started and pulled itself onto the trailer, and ran for about 30 mins. once I unloaded it. Of course, before making the trek home it will get an oil change and new fuel filters, etc., and a thorough mechanical inspection, but the one thing I'm puzzled and feel it may take me some time to sort out is that it seems very weak until the turbo spools - I'll take off and it accelerates very sluggishly until maybe 1/3 engine speed, then comes on hard and shoots up to the shift point. It does the same thing sitting in park, actuating the throttle by hand. Any suggestions to at least steer me in the right direction? I understand how diesel work but am not experienced with troubleshooting them. These engines are simple and insanely durable, likely your problem is something easy like the banjo bolt/line at the back if the exhaust manifold assuming the fuel filters are ok. Very rarely is it compression loss or a turbo issue, google the banjo bolt cleaning, as well as diesel purge procedure for that engine, typically that takes care of it (had quite a few of these cars). When was the last time the valves were adjusted that you know of? I have an 84 300d with same engine. Banjo bolt and pressure line check is a good idea. It sounds relatively normal though. I know if I rev mine up a little in park it will reach a certain rpm and the engine will quickly rev up without me giving it any more throttle. Same when driving. Give it 1/4 throttle and it takes off slow and then all the sudden it will pick up speed and rpm without giving it any more throttle. Your car sounds like its fine. There's a guy on YouTube who works on these. I think his channel is Mercedes Benz source. He's an older guy who wears a Mercedes Benz blue coat and mainly works on 80s Mercedes. Is this your 1st diesel? Diesel don't accelerate, but gather speed slowly, till the turbo kicks in. It's an old fashioned turbo-diesel, sounds like normal turbo lag for a car of this vintage. Thanks for the input, all. I just checked and cleaned the banjo bolt this morning - I have very faint pressure at the vacuum apparatus (can't remember the acronym for it) on the injector pump while revving, but the line to it from the banjo fitting on the intake runs through a valve on the firewall that may be why I'm not getting a direct signal. Yes? No doubt you're right about it just being a normal trait of the OM617. I'll inspect and adjust everything as soon as I have time and see how much good it does it. A 500-mile trip with Schaeffer's 9000 5w40 shouldn't hurt it, either. Not sure when the valves were last done but I'm sure they were at some point - I don't have all the maint. records for the car yet. I'll check them when I get it home, but until then I don't hear anything out of the ordinary from the top end. I got it on a lift this morning and gave it a good once-over - needs a lot of tweaking but it's really a solid project. I have one of these. Yes to the banjo bolt and yes to the valve adjustment. You may also find yourself with stuck, overheating brakes! Go through them very well. One of my w123s had the pad hardware swell up from rust and not move. The other had a miserable combo of sticky calipers and a master cylinder that wouldn't release pressure up into the reservoir when the pedal was all the way up. It is hard, when you have a car much slower than average, to notice a dragging brake until your fluid boils. These'll do 85+ in half decent tune. Ha, I was actually just thinking I should bleed the brakes before heading home. IIRC many owners confirm breaking 110 with them - speed limiting comes from meeting the redline right about then more than anything. impossible to keep well maintained. I also just bought one of these. I've got a 78 Brown 300CD. Unbeknownst to me was the fact that the floorboards and front rockers were rusted. I pulled the carpet back and the accelerator pedal broke free from the floor. The passenger rocker was rusted back to the A pillar. I've been cutting and welding for 3 months and I'm nearing completion. I highly suggest checking your floors and rockers. If the undercoat is even a little cracked, better sand it back and inspect. Can't wait to actually enjoy this thing! Yours looks good in white. I just put a cheap 14mm wrench on a grinder to make it a little thinner for valve adjusting.